Working in a knitting shop has inspired/forced me to learn the answers to all kinds of random knitting questions and since I’m feeling kind of random this Monday I thought I would answer one I hear a fair bit: What is colour pooling and how can I avoid it? When you hear those in the knitting know speak of colour pooling you may be picturing a swimming pool full of paint but this is not quite what they are talking about. 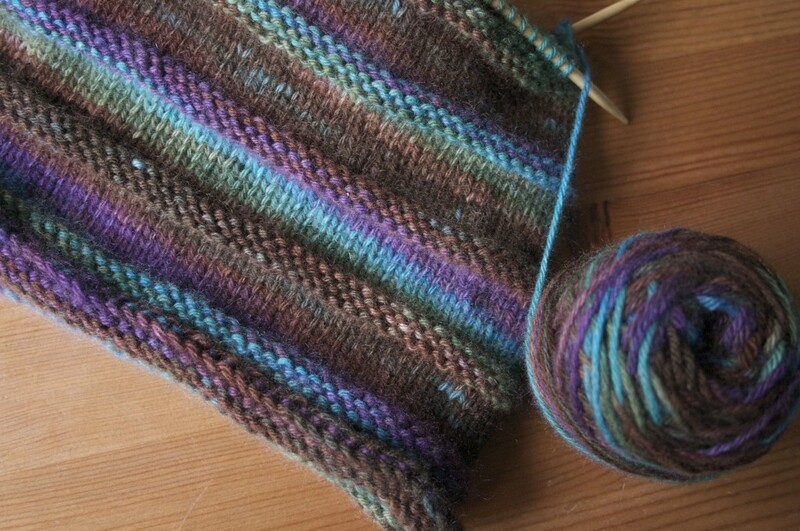 Colour pooling is something that happens sometimes when you knit with hand painted yarns. Let’s say you have a skein of hand dyed yarn that is purple, blue, and yellow. This yarn might do a number of things depending on the width or circumference of your knitted piece. 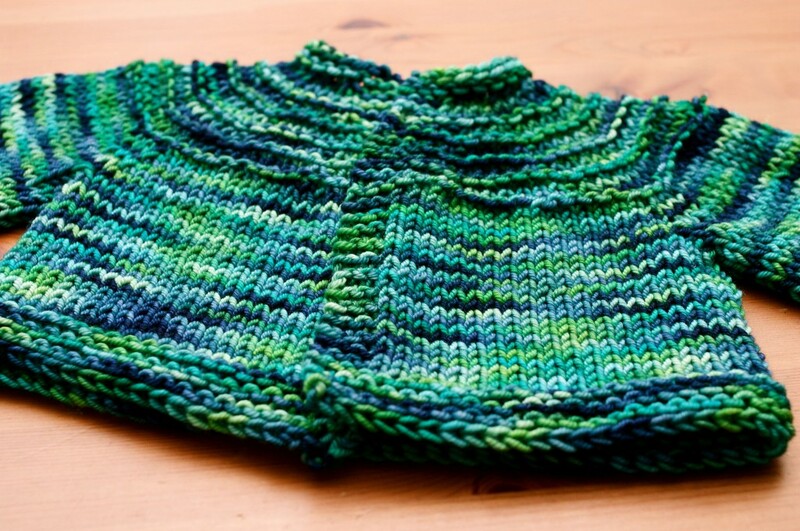 If the width or circumference of this knitted piece changes, so too might the pooling pattern. Sometimes the yarn appears to stripe a bit. Usually short repeats of colour will have this kind of effect. Pooling is what happens when these stripes of colour start to line up. This can create a patch or pool of one colour. You might have a purple and blue sock with a yellow pool at the back. This is colour pooling. This piece has no pooling, just flashes of each colour. I have sometimes heard people saying things like ‘oh, that yarn pools terribly!’ but I say not so! The colour pooling is dependent on the length of colour repeats in the yarn and the width or circumference of your knitted item. If the yarn pools terribly in one project, it does not mean it will pool in a different project. Colour pooling is not a feature inherent in the yarn, it depends. If you have a yarn with 4 inch colour repeats and your sock is 4 inches around, you won’t have pooling, you’ll have more of a stripe. If you are using a yarn and you don’t like the way the colours are lining up, it might be wise to adjust the size of your project or to pick one with different dimensions. Sometimes, as in the case of a sweater for example, different parts will have different widths so colours might pool in some areas and blend or stripe in others. For me, this is part of the beauty of knitting. I embrace these shifts in colours and move on. I don’t think this is a particularly common notion though so many of you are probably looking to avoid colour pooling! The best way I know of is to either use 2 balls or wind one ball into two and alternate every other row. You are much less likely to get colour pooling this way because you are mixing up the 2 balls. It can be a real pain but if you hate colour pooling it’s totally worth it. Some people cut their yarn every once in a while and start up at a different point. This seems like a lot of ends and no gaurantees so I don’t particularly recommend it. The other options is to love colour pooling! Sometimes it works beautifully in a project. 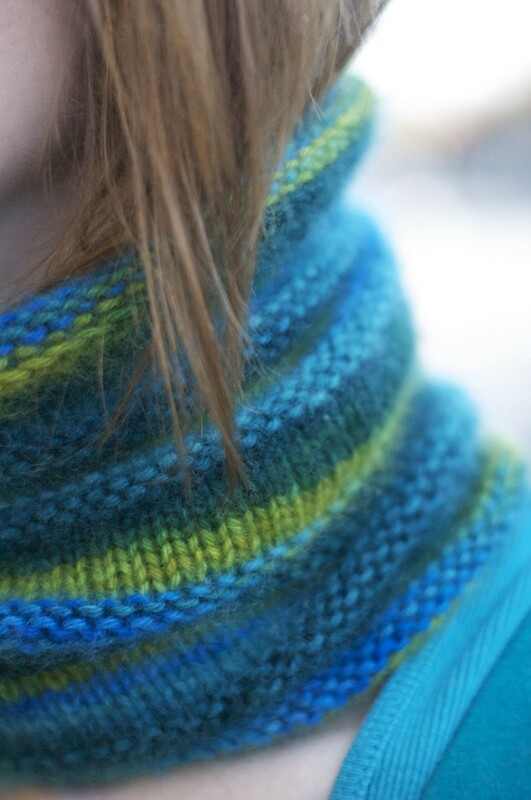 So beautifully in fact, it’s nearly impossible to replicate… like the Simple Yet Effective cowl featured above. I don’t think I’ll ever have anything colour so idealy again. That’s just the beauty of knitting though! This entry was posted on Monday, June 7th, 2010 at 9:10 pm	and is filed under Uncategorized. You can follow any responses to this entry through the RSS 2.0 feed. Both comments and pings are currently closed. Hi Urban Yarns, thanks for this great article! It is so informative, I had to link to it from the Vancouver Yarn blog. I love these blurbs you’re doing witht his site – and I especially love the myth-busting you’re doing.